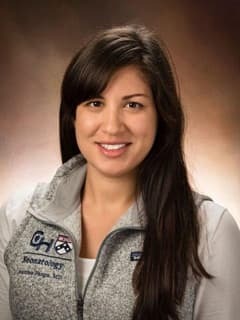 Joanna J. Parga-Belinkie, MD, is an attending neonatologist in the Division of Neonatology at Children's Hospital of Philadelphia. Parga, JJ, E Udofia, D Punguyire: Identification and understanding of preterm birth at Kintampo Municipal Hospital: a qualitative cross-sectional study. Afr J Reprod Health 15(4): 98-105, Dec 2011. Parga JJ, Kesavan K, Karp H, Bhatt RR, Sim M-S, Harper RM,Zeltzer L: Womb-like sounds: an intervention for apnea of prematurity. Poster Presentation, joint meeting of the Acoustical Society of American and the Acoustical Society of Japan, Honolulu, HI Dec 2016. Parga JJ, Valadez M, Gulian AS, Holdbrooks H, Sklansky M: Handshake-free zone in the neonatal intensive care unit: initial feasibility study. Poster Presentation, American Academy of Pediatrics National Conference and Exhibition, San Francisco, CA Oct 2016. Parga JJ, Kesavan K, Karp H, Bhatt RR, Sim M-S, Harper RM, Zeltzer L: Womb-like sounds: an intervention for apnea of prematurity. Poster Presentation, Children's Discovery Institute Science Day, Los Angeles, CA May 2016. Parga JJ, Kesavan K, Karp H, Bhatt RR, Sim M-S, Harper RM, Zeltzer L: Womb-like sounds: an intervention for apnea of prematurity. Poster Presentation, Pediatric Academic Societies Meeting, Baltimore, MD Apr 2016. Parga JJ, Walker V: Neonatal splenic hematoma causing hemoperitoneum and hypovolemic shock. Poster Presentation, Western Society for Pediatric Research Meeting, Carmel, CA Jan 2016. Parga-Belinkie JJ. Womb-Like Sounds: An Intervention for Apnea Of Prematurity. Western Society for Pediatric Research Meeting; 2016 Jan; Carmel, CA.